I’ve blogged before about content marketing and its position in the world of digital media. But it’s worth remembering that there are other ways to provide useful content for your customers – without them needing to access a computer. As Christmas turned into New Year, I came across two excellent examples of content marketing done the old-fashioned way. 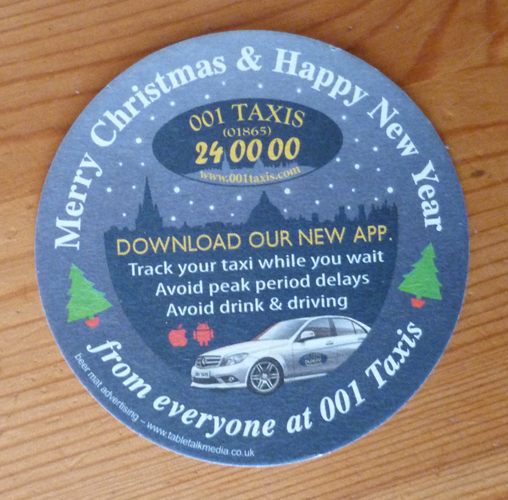 In a city centre pub I saw a beer mat with the message ‘Merry Christmas & Happy New Year from everyone at 001 Taxis’. It was a friendly, seasonal message, with an eye-catching seasonal design. It also had some supplementary information: a call to action (‘Download our new app’) and a message about avoiding drink driving among other key benefits. My second example was the 2014 desk calendar that I was sorry to say goodbye to as the year came to an end. It came from Seacourt Printing, a company that specialises in environmentally responsible printing. 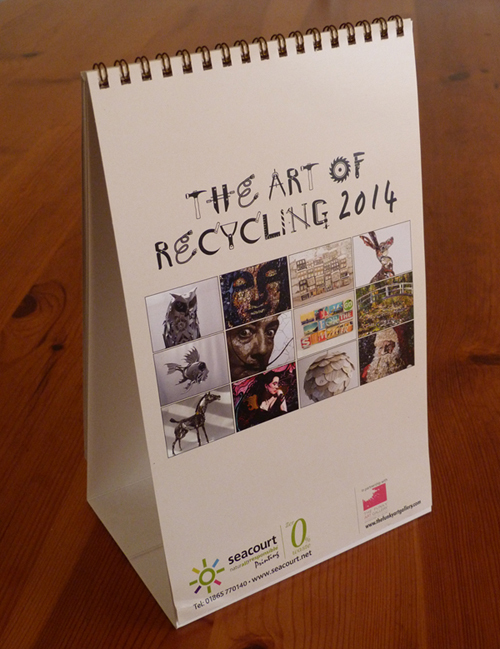 The calendar is titled The Art of Recycling and features artworks made by up-cycling waste materials: an owl made of hub caps, a lampshade made from old books, and my favourite a portrait of Salvador Dali made from stone, ceramic tile, torn paper and plectrums. Promotional calendars are nothing new either, but this one matched the company ethos and reinforced Seacourt’s image as environmentally aware. It ties in perfectly with their description of themselves as ‘the world’s first zero waste to landfill printing company’. It is likely to appeal strongly to their target market – people who share the same values. Both are very different companies, and with very different answers to the question of building customer loyalty through content. But both succeed because they know their customers, and because they put customer needs first – while ensuring that this aligns with their own business goals and identity. It’s a lesson worth learning, whatever medium you choose.